It told you there was a boom, it warned you of the bust, and now it’s telling you that this is one slooooow recovery. 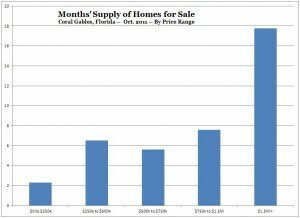 The little uptick in the data for September 2011 is as much dark cloud as silver lining. All of the gain came from construction of multifamily (5 or more units) buildings. Nevertheless, the data set overall appears to show a durable bottom in place. Another positive note is that the NAHB/Wells Fargo Housing Market Index (commonly known as the homebuilder sentiment index) jumped to 18 from 14. 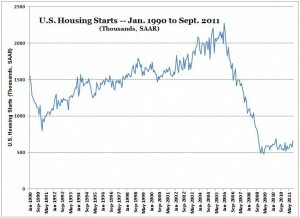 Like housing starts data, HMI told you there was a boom and warned you of the bust. A reading of 18 is still quite negative (below 50 is considered pessimistic), but it’s a significant step back from the edge. The low back in spring 2009 was in the single digits. Slowly better is better than worse. 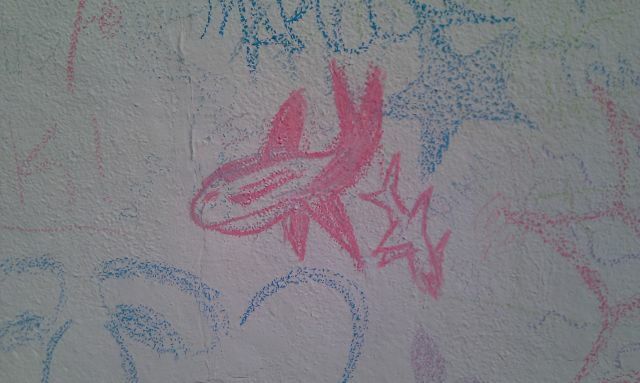 The seasons are subtler variations in Miami than up north, but they are real. Seems like someone flipped a switch and officially ended summer on October 15. In the first 15 days of October, there were only 2 days below 85 F. Since the 15th, we haven’t seen that mark again. Nighttime lows in the cool 60s underlined the point. But after two rainy weekends, the sunny skies and tepid temps were like a blank canvas for the art of outdoor fun. All of which set the mood for events that seemed in tune with the approach of winter — otherwise known as high season — when snowbirds migrate just to remain in shirt sleeves and only the vacationers think of wearing a bathing suit at the beach. Miami and Coral Gables assume an air of sporty sophistication rather than summer sultriness. The weekend’s opening of the Coral Gables Museum was celebrated by those who helped make it possible. 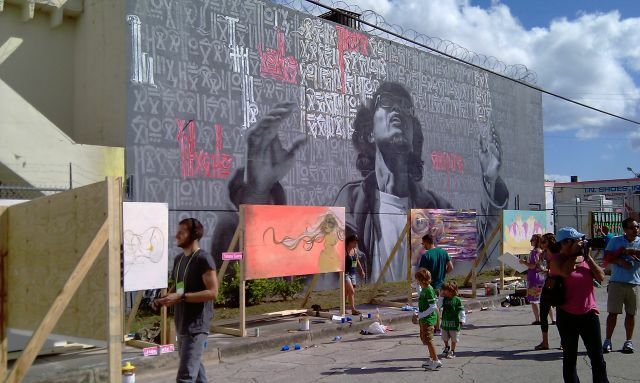 And the Wynwood art fair celebrated those who make just about anything. 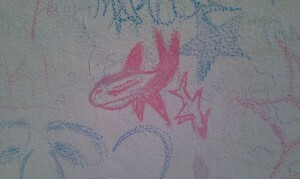 Attendees were encouraged to make their mark. 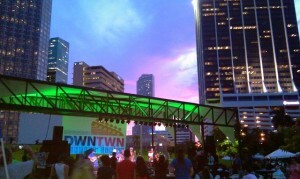 Other harbingers of winter include the DWNTWN Miami concert series, which kicked off October 14. 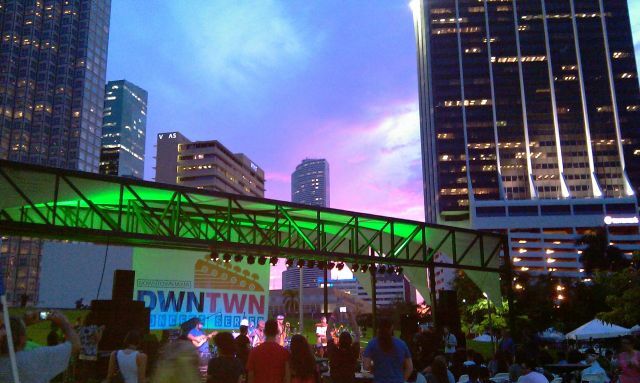 Dates for the rest of the DWNTWN series: November 11, December 9, January 13, February 10 and April 13. Performers TBA. High season and high culture are synonomous, and the events become increasingly haute as the temperature becomes increasingly bas. Miami Beach brings another installment of Sleepless Night on November 5, followed by Art Basel on December 1-4. If you haven’t got your day cravats out of storage by then, you’ll never amount to anything. 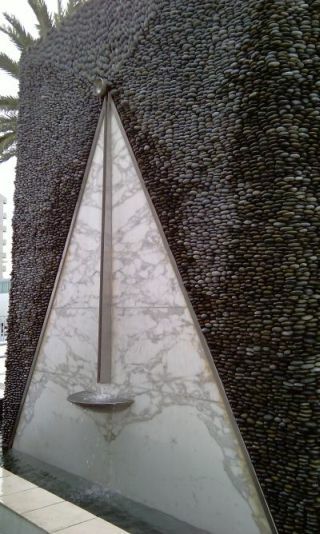 Fountain at pool deck of Jade condo, 1331 Brickell Bay Drive, Miami, Florida.